This should fix one issue I’ve always had with Flip (and Flip-like) cameras. It’s a “professional-quality” external microphone called Mikey for Flip. 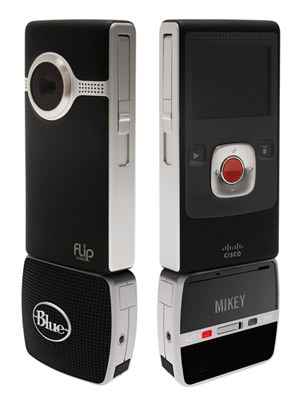 Developed by Blue Microphones, you plug it in, and then you’ll actually be able to hear audio produced by a Flip camera. A novel idea! It’s not out yet so don’t get too excited (it’s said to debut next January, at CES), but we can use the next few seconds to think this over. First, it only works with Flip cameras that have a Flip port. As you can see, it doesn’t even really look like a traditional boom or shotgun mic you’d see attached to a camcorder. Nope, it’s tiny, sitting right on the base of your Flip. It has two sensitivity settings, Loud and Automatic, depending on what you’re recording, and it’s powered by a single AAA battery—wouldn’t want the mic draining power from your Flip! So yeah, could be pretty solid for those of you still slinging to your Flip. And even though it won’t be available for some time, Blue Microphone already has a price in place: $69.